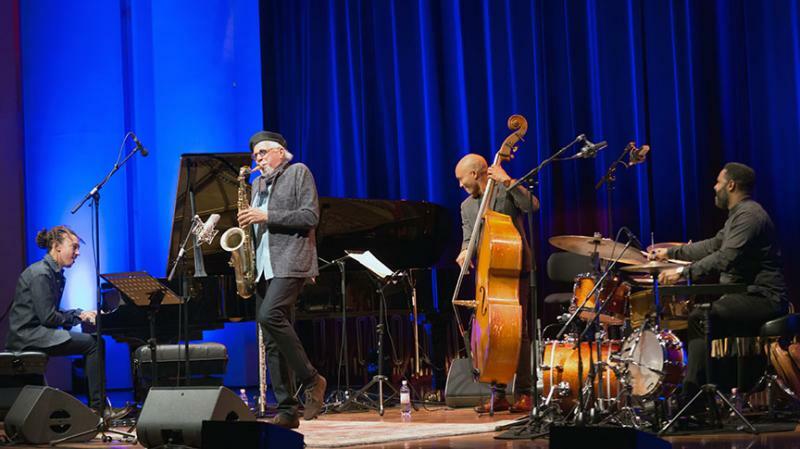 Charles Lloyd, one of jazz’s historic greats, returns to Dublin with his classic quartet on Wednesday 16 November for a one-off show on Irish soil as part of an extensive European tour. Described by Nate Chinen as “a storyteller with a seeker’s heart… one of jazz’s great mystery men”, the show comes two years after Lloyd’s triumphant performance at the NEC, but this visit offers fans the rare chance to see NEA Jazz Master Lloyd in the more intimate, club-like surroundings of the legendary Vicars Street. Lloyd is enjoying renewed critical acclaim, over half a century since he first made waves with albums such as Dream Weaver (Atlantic, 1966) and the epoch defining Forest Flower (Atlantic, 1966)–the first million-selling jazz album. In recent years, Lloyd has released a slew of critically acclaimed albums for ECM and recently released his first albums for Blue Note in over thirty years–the specially commissioned Wild Man Dance (Blue Note, 2013) and I Long to See You (Blue Note, 2016), the latter which features Bill Frisell and guest appearances by Willie Nelson and Norah Jones. His eventual re-emergence into the limelight in the late 1980s has been well documented, but suffice it to say Lloyd’s current band featuring Reuben Rogers, Kendrick Scott and Gerald Clayton is one of the finest quartets of his long and distinguished career. At 78, who knows how many more European tours Lloyd has left in the tank, so this Vicars Street concert is a fantastic opportunity to experience one more time—for the price of a meal—one of jazz’s most exciting, uplifting performers. Charles Lloyd at Vicars Street on Wednesday 16 November promises to be one of the very best concerts, not just of jazz, but of any music, to hit Dublin in 2016. Tickets are available through Ticketmaster.ie at 39 Euros for a general ticket and 69 Euros for the premium ticket, which includes meet-and-greet with Lloyd and a free CD.